Before deployment begins, we establish a technology deployment team comprising your employees and DSI professionals. 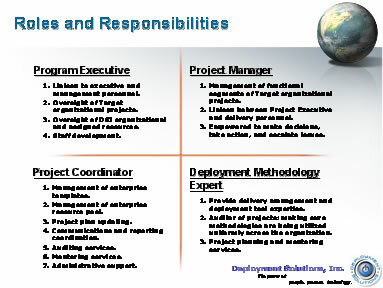 This team outlines the roles and responsibilities for each team member and defines the various processes associated with deployment. Regular communications are distributed throughout the process, so that everyone involved and impacted by the deployment is kept informed of progress. This communication also serves as a method to raise any issues and manage expectations. DSI PMs are considered successful when a Project delivers according to expectations and on-time. Deployment Solutions’ Project Management uses our proven methodology that enables the successful (timely and accurate) implementation of customer projects. What differentiates DSI is not just our technical abilities, but also the precision with which our associates execute their engagements. We combine many accepted industry standards with our best in-house practices. DSI’s PM team provides our customers with advanced project management, tracking, and a project support desk (PSD). By combining excellence in Project Management with a comprehensive suite of deployment tools and best practices approach, Deployment Solutions ensures your Program or Project success. While each client project or program will have only one PE, the number of supporting staff will vary greatly depending on the specific scope, size, and deliverables. In addition, we typically assign a separate support staff to handle the staging, integration, and configuration aspect of our solution set. The still report back through the single assigned PE. Our Project Teams consists of world-class talent from the deployment services industry with real world project rollout experience and knowledge for some of America’s most noted companies. This blend of experience and knowledge, combined with our passion for integrity and commitment to excellence, makes DSI a powerful and devoted ally in deploying your digital infrastructure.